The townland of Glancuttaun Upper is situated in the parish of Kilorglin on the northeastern side of the Iveragh peninsula in Co.Kerry. The landscape here comprises areas of low-lying farmland shadowed by low mountainous terrain with it’s rough grazing lands. A quick look at the First Edition 25 inch Ordnance Survey sheet shows field patterns that demonstrate how the lands and landscape here were exploited in the past; by the roadside and in the low-lying, more fertile areas we find tightly packed, small enclosed fields close to the clachan style settlements that are so characteristic of the rural Irish landscape. The mountain sides remain unenclosed. These field patterns reflect a system of farming and animal husbandry in Ireland that stretches back millenia. Traditionally, cattle farming was the mainstay of Gaelic life in Ireland, and stock was effectively currency. Early law tracts dedicate significant detail to the care of cattle, and rights and obligations of cattle owners. During winter, stock was commonly kept enclosed about the homestead, while in the summer months, cattle were driven to rough summer grazing in the uplands. This ancient settlement pattern is still visible today in the modern landscape around Glancuttaun. It is on the low-lying and more populated lands of Glancuttaun Upper that Glencuttane National School was constructed in the late 19th century. Dating to 1887, it is merely a ruinous, roofless frame of a building today. The thinly spread soil around the school is often water-logged, and on an overcast day that I visited, it seemed a particularly dour place. Having said this, I passed here again on a brighter afternoon, and the fair weather helped to lighten the sad look of the old grey building. The building itself comprises a detached five-bay, single-storey national school, built c.1887. To the front there is a single-bay single-storey gabled projecting entrance bay to the centre. The school is enclosed by a rubble boundary wall with stone-on-edge coping, and includes wrought-iron gates that are entangled with the overgrown grass. The original slate roof of the school has been removed exposing the interior of the building to elements. The glazing is gone, and the weather beaten exterior looks a sorry sight by the roadside. Inside there are two classrooms with fireplaces located centrally in the building. The suspended floor has collapsed, and I had to negotiate the rubble, being careful not to impale myself on the debris. Some cute details remain in the building such as the wrought-iron coat hooks in the entrance hall, but the building is largely a ruin that is difficult to negotiate. Nonetheless, the building once served an important social role in the local community. However, Glencuttane school house is absent from the National Inventory of Architectural Heritage, despite it’s social and architectural value. This is a phenomenon that I have highlighted before, where identical school houses in different counties may or may not be included in the National Inventory, with no clear reasoning behind their absence or inclusion. Although the NIAH is a national inventory, it is not homogeneous from county to county. Is this something that can be addressed? The Dingle Peninsula (or Corca Dhuibhne) in Co. Kerry stretches some 30 miles (48 km) into the Atlantic Ocean from Ireland’s south-west coast, and is a popular spot for holiday makers. 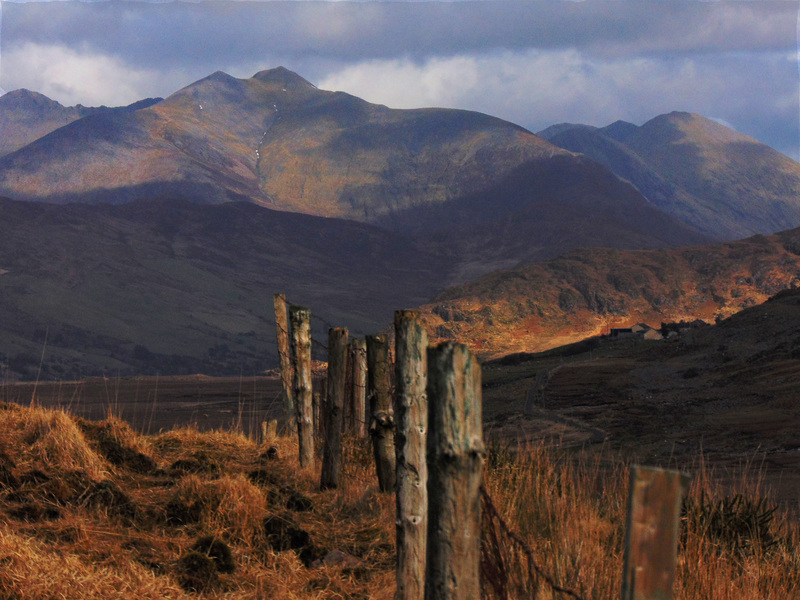 The peninsula is dominated by mist-covered mountain ranges that form its spine, running from the Slieve Mish range to Mount Brandon, Ireland’s second highest peak. The coastline consists of steep sea-cliffs, broken by sandy beaches, with two large sand spits at Inch in the south and the Maharees to the north. Off the west coast lie the Blasket Islands; inhabited until 1953 when the last remaining islanders were forcefully evacuated to the mainland on 17 November by the Irish government. It is an area of outstanding natural beauty, and despite a busy tourist season, it is a peaceful place that retains it’s rural feel. The principal town on the peninsula is Dingle; a major fishing port in Ireland, with the industry dating back to about 1830. The fishing industry brought the railways to the town, and Dingle was formerly the western terminus of the narrow gauge Tralee and Dingle Light Railway. The railway station opened on 1 April 1891, closed for passenger traffic on 17 April 1939 and for regular goods traffic on 10 March 1947, finally closing altogether on 1 July 1953, by which time a cattle train once per month was the sole operation. The railway line weaved along the south coast of the peninsula on it’s way from Tralee, crossing a flat, low-lying area between Lispole and An Cnoicin known as Droichead An Imligh (Emlaghmore Bridge). It is adjacent to the former railway line and the modern N-86 road in the townland of Clooncurra ,that you’ll find an early 20th century school house no longer in use. It’s a Sunday evening in late July in south Co. Kerry. The summer air is warm but heavy, and the sky is overcast though there are occasional bursts of sunlight through gaps in the temperamental cloud cover. This kind of weather is disappointingly common in Ireland at this time of year, with sporadic heavy showers of rain in between the dry spells. I’ve arrived at Gortnabinny townland, located about 10 km south of the town of Kenmare; a rural spot at the gateway to the Beara Peninsula. The surrounding landscape is hilly; the ferns are a lush green colour, and in the damp, heavy warmth of the evening, the dense greenery and woodlands seem tropical. Earlier this day I had met Simon Linnell in Kenmare. He’s involved with a local cultural and historical research group in the town, and each year they publish the ‘Kenmare Chronicle’, a journal dedicated to documenting various aspects of the local heritage. He tells me that this year the group have been researching the many disused school houses located in the area, and has given me a hand-drawn map which shows the locations of the schools he’s identified. Gortnabinny is my last stop on Simon’s map. Leaving the humid roadside which is arched by a canopy of the most vibrant green deciduous trees, I make my way up a low knoll and through the wet woodlands; toward the crest of the hill I can see the remnants of single-storey building hidden behind pine palms, dripping after the most recent sun shower. Situated 15 km to the southwest of Ballaghasheen Pass on the Iveragh Peninsula, modern-day Mastergeehy could just barely be considered a village in terms of its size. The ‘Kerry Way’ walking route passes through this tiny hamlet on the valley floor, bringing the occasional adventurous tourist. Steep, forested slopes to the northwest and southeast act to funnel the prevailing Atlantic winds through the area, and have given the townland its name (‘master of the wind’). With the exception of the local Post Office/shop (located in the front room of one of the handful of bungalows in the village), there are little or no services or distractions in this beautiful, sparsely populated and isolated location. 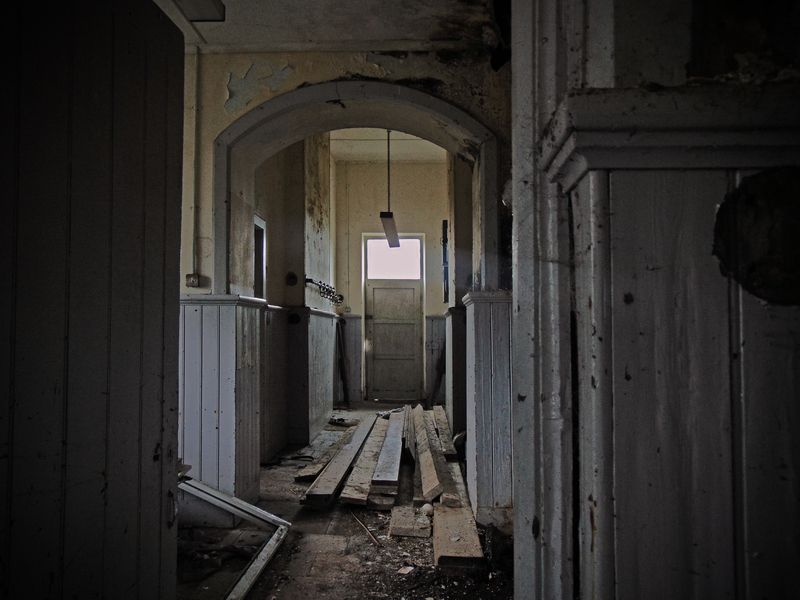 Like at so many other of the disused schools that dot the rural Irish landscape, it is difficult to picture a time when there were enough children in this locality to support a school house.